My thanks again to Rocket Matter for sponsoring MacSparky.com this week. The future of legal practice management is an online web-based service where you can use any operating system and any platform to get work done. Rocket Matter is the leader on this front and the kind of company you want to do business with. Are you interested in working in the cloud? 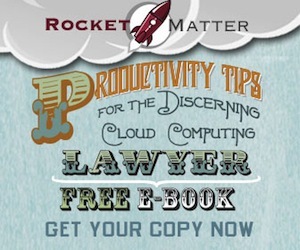 Download this week's free ebook, Productivity Tips for the Discerning Cloud Computing Lawyer.